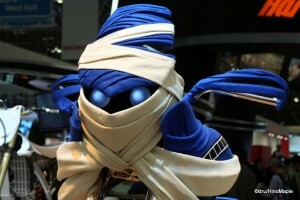 The 2009 Tokyo Motor Show is being held from October 29 until November 4 at Makuhari Messe in Chiba. As of posting this, there are only a few days left until the end. This year, due to the economic downturn that started in 2008, the show was left in limbo up until this past summer. There are less than half of the exhibitors in this year’s show compared to the last show in 2007. In 2007, there were over 240 exhibitors, and this year it’s just over 100. This is a significant decrease, and it shows. The event space is more open, and reduced. There are no longer any outdoor exhibits, and they only make use of the convention centre’s main hall. The North Hall and central Exhibition Hall are no longer used. The outdoor element in the central plaza is also discontinued for this year. It’s a bit of a shame that there are only two foreign car makers present at this show, but it was still a great show to visit. The first thing to do when heading to the show is to actually head to the show. Makuhari Messe is a huge convention centre, and without the North Hall being open, it’s a bit of a walk to the main entrance. From there, there are three major halls to visit: the East, Central, and West halls. Each one has its own group of manufacturers. This year, the West Hall was occupied by Honda, motorcycle manufacturers, and various other parts companies. The Central Hall had Toyota, Subaru, Mazda, and a special Car of the Year Japan exhibition. In the East, Nissan and Mitsubishi had large displays while the Gran Tourismo and Tomica moved into the main hall from a side hall two years ago. The amount of space needed was dramatically cut down, but there was always a lot to see. 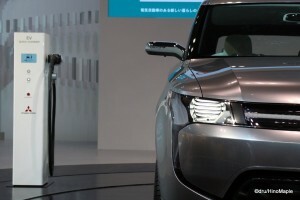 With the European and American companies opting to not go to the show, the Japanese companies made up for it with their concept cars. The theme was the environment. It was great to see so many hybrids and electric vehicles. They even displayed various walking machines similar to the Segway, but seated versions. All of the cars were busy with photographers taking as many pictures as they could. 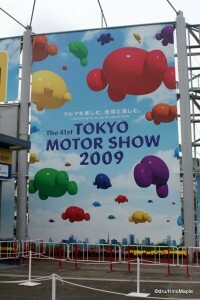 Toyota and Honda were one of the busiest exhibitions. There were also several “race queens” at each booth modeling all of the cars. While the size of the show was reduced, the number of girls showing the vehicles was the same, proportionately. Interestingly enough, each maker seemed to choose their women based on their overall theme or target audience. Some chose women in their 30s, and some chose women in their 20s. Some had more elegant clothing, while others made their girls look trashy. Image is everything, and as long as it fit, anything would go. Unfortunately, this year was a bit small. Many people say the Japanese show is no longer an “international” show. While I agree that it isn’t as grand as before, it’s also a tough year. With other cities being more important, it’s natural to think that the Shanghai show will be bigger. Will it always be bigger? I’m guessing that in the future, the Tokyo Motor Show will increase again as the auto makers make more money and have the ability to display their cars at more shows. It’s a little expensive, but if they want to keep their business in Japan, they’ll have to keep at least a small presence at these shows. 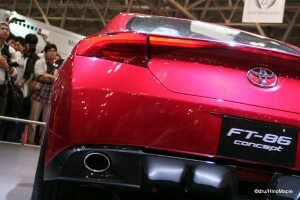 This entry was posted in Festivals, Motorsports, Tokyo and tagged 2009 Tokyo Motor Show, Chiba, Chiba-ken, concept, concept car, concept vehicle, FT-86, FT86, japan, Kaihin Makuhari, Makuhari, Makuhari Convention Center, Makuhari Convention Centre, Makuhari Messe, Messe, MiEV, Mitsubishi, Mitsubishi MiEV, Mitsubishi PX, Mitsubishi PX MiEV, Motor Show, PX MiEV, Super Tenere, tokyo, Tokyo Convention Center, Tokyo Convention Centre, Tokyo Motor Show, Tokyo-to, Toyota, Toyota FT-86, Toyota FT86, Yamaha, Yamaha Super Tenere, メッセ, 千葉, 千葉県, 幕張, 幕張メッセ, 日本, 東京, 東京モーターショー, 東京都, 海浜幕張, 海浜幕張駅 by Dru. Bookmark the permalink.